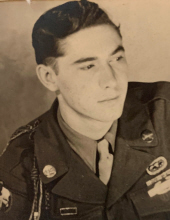 Harry Lee Shull, 93, of Dayton, passed away Wednesday, April 10, 2019 at Harrisonburg Health and Rehabilitation Center. He was born in Dayton on December 6, 1925, and was a son of the late Mervin A. and Priscilla (Blosser) Shull. Harry was a master plumber at Shull's Plumbing and Heating and retired 1988. He served his country in the U.S. Army during WW II. He was a member of St. Andrew's Church in Weyers Cave. He enjoyed playing the guitar in his church gospel group and attending his WWII veteran reunions. Harry was married twice, first married to Charlotte (Shipe) Shull, on December 25, 1947, and she preceded him in death on December 10, 1997. Then in August of 1998 he was united in marriage to Dorothy Shull, who survives. In addition to his wife he is survived by his two daughters, Barbara May and husband William "Bill", of Sipesville, PA and Susan Wealthy and husband Roger, of Elkton; his son, Allen Shull and wife Kathy, of Rockingham; a sister, Ethel Shipe, of Archbold, OH. a brother, James "Jimmy" Shull and wife Hazel, of Dayton. He is also survived by four grandchildren, Mark May, Marsha Hutzell, Scott Shull, and Greg Shull; and eight great grandchildren. He was preceded in death by his daughter, Peggy Shull, and a brother, Earl Shull. A graveside service will be held at 2:00 PM on Monday, April 15, 2019 at Dayton Cemetery with Pastor Doyle Payne officiating, and military rites by the Dayton American Legion Post #27. The family will receive friends on Monday from 11:00 AM to 12:00 Noon at the Johnson Funeral Service in Bridgewater. In lieu of flowers, memorial contributions may be made to Bridgewater Rescue Squad, PO Box 268, Bridgewater, VA 22812. To send flowers or a remembrance gift to the family of Harry Lee Shull, please visit our Tribute Store. "Email Address" would like to share the life celebration of Harry Lee Shull. Click on the "link" to go to share a favorite memory or leave a condolence message for the family.